We're so confident that we have the lowest total price available after shipping and any other fees that if you find the same product available on another web site at a lower total price after shipping and any fees, we'll match it if you haven't ordered yet or we'll refund you the difference if within 30 days of purchase! Click here for details. We're so confident that we provide the highest performing, most reliable and secured printing supplies that if you're not completely satisfied with any item (excluding tax forms and MICR Printers), just return the unused portion within 45 days from the date of shipment of merchandise to receive a full refund or replacement! Click here for details. Why not tax forms? Because tax forms cannot be resold or placed under any valid warranties, but if you received a different tax form than the one you ordered, contact us and we'll replace it with the correct tax form at no charge. 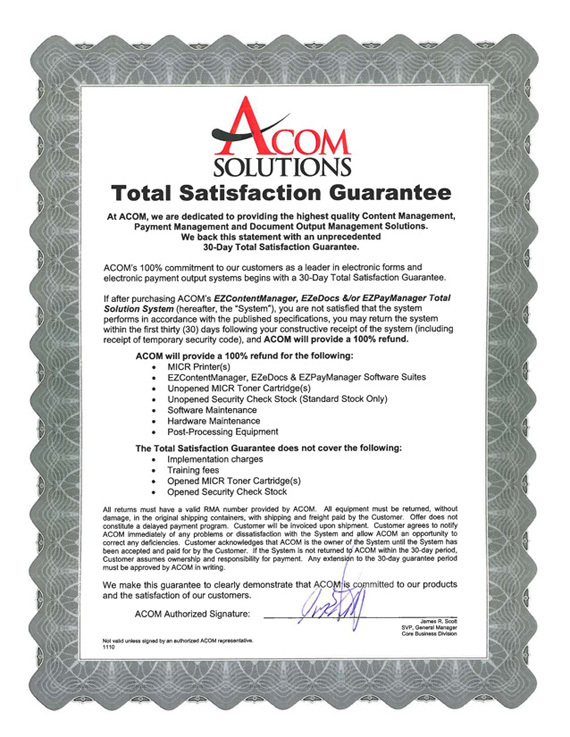 MICR printers have a 30 day "performance guarantee" click here for details. MICR printers also have an additional optional 4 year guarantee that checks printed on our MICR printers will meet ABA MICR specifications and standards for performance click here for detail. With our one-year 100% Product Quality warranty, you can return any toner product for a replacement for up to one full-year, or until the toner is depleted, whichever occurs first. Simply call us at 1-800-347-3638 or email ordersupplies@acom.com to get a return authorization number and your replacement as soon as possible.